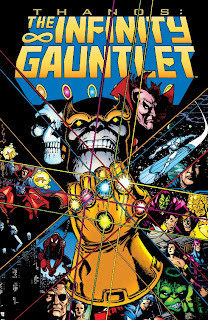 I have written a post on the overall Infinity Gauntlet story. You are remembering correctly. Thank you for being such a dedicated reader and pointing this fact out...jerk. What I am posting on now is the individual issues which make up Jim Starlin's classic tale of Thanos, the mad titan, and his glove of supreme dominance which unites the power, soul, mind, time, reality and space gems. Next Wednesday, a comic book club I am involved in will be talking about this Marvel event, and I thought going through each issue and writing a bit about what caught my attention would be a great way to collect my ideas. Bam! Right off the bat, the George Perez cover is mind blowing. 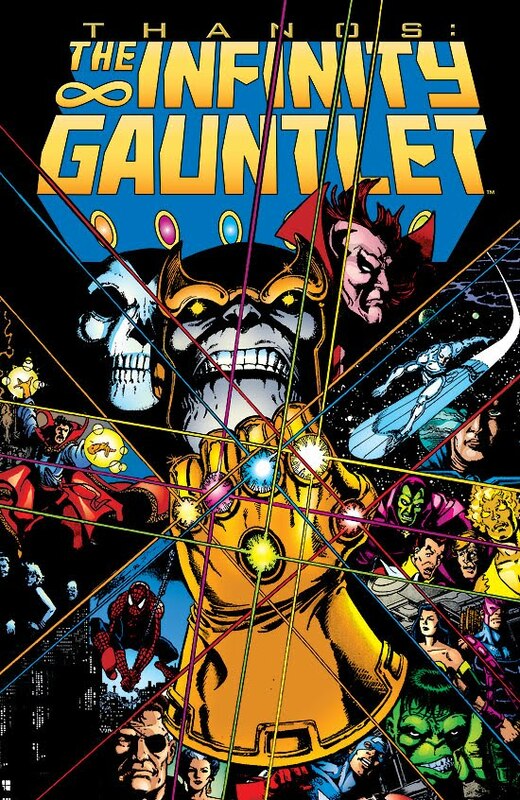 The main guy, Thanos, sits dead center revealing the mighty Infinity Gauntlet with a clenched fist. Thanos displays might and power which effects every character around the universe and cover. Perez's cover sets the tone of the enormous scale and epic adventure contained with in this comic of the day. Two specific panels in The Infinity Gauntlet #1 book are memorable for me. The first is the first appearance of Thanos on the second/third page spread. He is standing in front of Mephisto, at the edge of a ledge, staring at rock lettering which reads, "GOD." The 2 page spread stands out because it literally stands out. The way the inking and coloring is done here gives a 3-D effect movies of today, such as Step It Up 3-D, would envy. The second panel is very subtle, but done just right. The panel where Thanos snaps his Infinity Gauntlet wielding fingers to end half of everything in the universe's lives is simplistically perfect. Besides the word snap, the gauntleted hand is silhouetted all in black with sparkles of white light in place of the gems. The image shows with but the simplest of motions Thanos has absolute power at his finger-tips. The mostly black and white image is haunting. The first issue establishes the tone of the series. Thanos is more powerful than anything the Marvel Universe has ever seen and is driven by two common themes: proving love and holding power. Thanos is basically Huey Lewis with "The Power of Love."